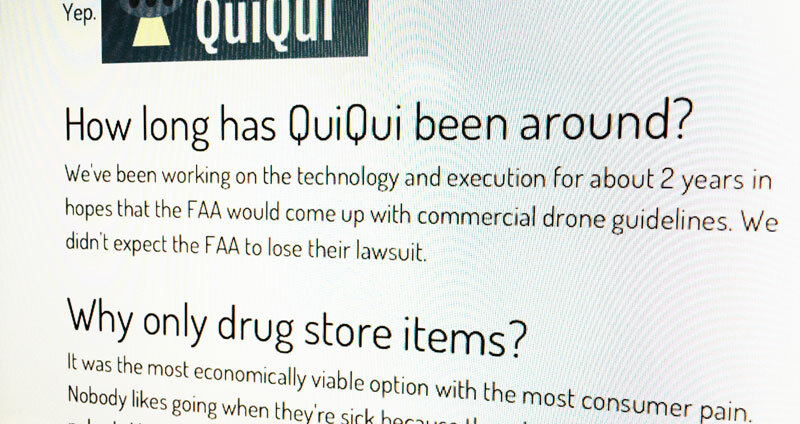 The Federal Aviation Administration’s rules on civilian use are currently on hold by a federal court, and in the interim, companies are scrambling to take advantage of using drones to deliver product. Sending packages through the air isn’t a novel strategy; it can be traced back to supply planes making airdrops of food and supplies to troops in WWII. 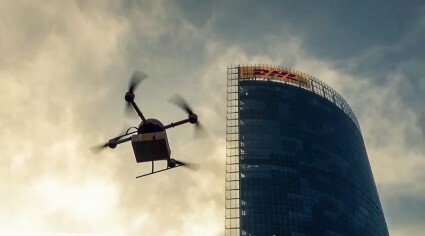 But companies throughout the world have discovered that unless it’s a large package like a television or a computer, drones are capable of handling most product delivery. Amazon’s Jeff Bezos estimated that using drones to deliver small items could handle 86 percent of Amazon’s shipping. Although Amazon has received the most press about their possible use of drones, the practice has already been going on in other countries. In southern China, a company called SF Express began using drones early in 2013; DHL, Europe’s largest parcel delivery service, has been flight-testing drones since 2013; and Domino’s Pizza in the UK is also testing drones for pizza delivery. But there are some challenges to using drones outside of the battlefield. In 2011, Raphael Pirker used a small drone with a foam wing weighing less than five pounds to shoot a promotional video over the University of Virginia. He flew under bridges, near statues and over pedestrians; this drew the attention of the FAA, which considered his conduct reckless and fined him $10,000. Pirker challenged the fine in federal court, saying that the agency was holding him to the same standards as airline pilots; the FAA responded by saying the agency has jurisdiction over anything flying in American airspace, whether manned or unmanned. The judge disagreed and ruled against the agency, saying it had no rules in place for dealing with small unmanned aircraft when they fined Pirker. In his decision, he wrote that if he accepted the FAA’s argument, “a flight in the air of a paper aircraft, or a toy balsa wood glider, could subject the operator to” FAA procedures and fines. The FAA filed an appeal, leaving drone regulation in legal limbo. Drones can pinpoint security risks, check for thermal signatures in flaming buildings, and now deliver your prescriptions to your door—although not quite to your hand just yet. While the FAA has been trying to regulate drone flights, many uses have already been found for them – and drone deliver is the latest trend. Las Vegas’ Marquee Dayclub will provide bottle service by drone to customers who spend at least $20,000 on liquor. Amazon is implementing its own drone program known as Prime Air to get packages to customers in 30 minutes or less – but they are waiting for the regulations before proceeding too far. Currently the FAA projects their new regulations to be published in 2015. Other inventors are looking to supply drones; a partnership between the University of Cincinnati and Amp Electric Vehicles has developed the HorseFly, which has eight rotors instead of four – making it not only better for carrying more items, but safer to fly in case one rotor goes out. The future of commercial drone delivery service rests on the FAA: although they have established some test sites, businesses will likely not get clarity on the legality of commercial drone use until 2015 when the new rules come out. We may have to wait until then see drones moving freely throughout the skies.